Yes, it’s been a year since that fateful night when I made the big decision to buy an Amazon Kindle (or a Kindle Keyboard, as my model is now known). It was a big decision for several reasons. Up to that point, my experience with ebooks had been very limited; at the time, it would be the riskiest purchase I’d make online (Kindles were not yet available in Australia); and I’d been officially bankrupt for just over two months. 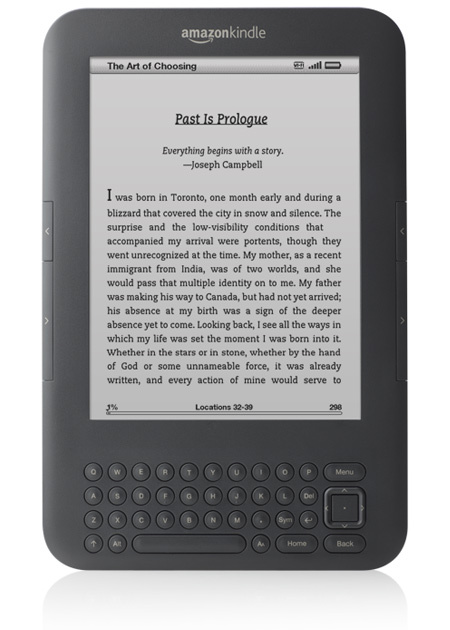 That was why I spent an hour or so of umming and ahhing about whether I should buy a Kindle or not – because back then, perhaps it was one of the last things I should be buying. But ultimately, I decided to do it. And twelve months later, I’m very glad that I did. Two of the main reasons that convinced me to risk buying the Kindle were to save money and stop cluttering my home with books. And save money and stop cluttering I certainly have. …but not only are they 368 books that would otherwise be taking up space in my home; on average, I’ve saved roughly $15-20 per title by buying them as ebooks rather than books from local stores. But there’s more than just the money and space that I’ve been saving. One of the biggest advantages, of course, is portability. I can now travel anywhere with hundreds of books at my disposal (and one day, perhaps, thousands). This was particularly invaluable during my recent three weeks working in Canberra. Another advantage of having the Kindle is being able to obtain titles that are not available in Australia, or would have been off-puttingly expensive if I’d tried to buy them as books from overseas. As a result, I am never without anything interesting to read – and if I get a sudden craving for a certain author, genre or subject matter, it’s usually easy to meet that need (Amazon.com and wifi permitting, of course). Re-reading my two old posts above, it’s amusing to see what I wrote back then and what I’ve actually done since. I didn’t finish reading Bloodlands: Europe Between Hitler and Stalin because the author’s style became too flat for my liking – but I’ll never forget what I did read about the horrors of the Ukriane famine that Stalin engineered in the early 1930s. That was some of the most awful history I have ever read (I studied Soviet Russia in senior high school, but never in such detail back then – fortunately). I have yet to buy ebook editions of The Kindly Ones and The Passage to replace the mega-arse paperback editions that I own – but they are still there on my Amazon Wish List, and recently I have been replacing other print favourites with ebook editions. And I did buy a stand at the local Apple Store. It’s a solid metal fold-up piece designed for iPads that set me back $70, but it was worth it – and in case or emergency self-defense, it could also make a hand-weapon with good heft. During the past year or so, I’ve been listening to more and more podcasts. This in turn has led to a growing interest in audiobooks, and so recently I began subscribing to Audible. Sometime in the future, I’d also like to get into ebook editions of graphic novels, but this is one area where my Kindle can’t help, alas. I was considering a Kindle Fire for this type of reading, among other things, but the larger screen of a tablet like the iPad is more appealing. …but then again, up until late on the night of 21 April 2011 I didn’t see myself buying a Kindle until “later this year”, and look what happened. This entry was posted in Action, Bibliophilia, Gratitude, Happiness, Life Strategies, Reading. Bookmark the permalink.